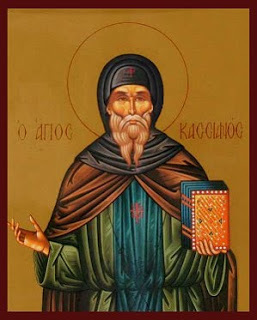 St. John Cassian: The thief who received the kingdom of heaven, though not as the reward of virtue, is a true witness to the fact that salvation . . . The thief who received the kingdom of heaven, though not as the reward of virtue, is a true witness to the fact that salvation is ours through the grace and mercy of God. All of our holy fathers knew this and all with one accord teach that perfection in holiness can be achieved only through humility. Humility, in its turn, can be achieved only through faith, fear of God, gentleness and the shedding of all possessions. It is by means of these that we attain perfect love, through the grace and compassion of our Lord Jesus Christ, to whom be glory through all the ages. Amen. This entry was posted in Sayings from Saints, Elders, and Fathers, St. John Cassian and tagged Compassion, Divine Love, Fear of God, Grace, Grace of God, Holy Fathers, Humility, Love, Mercy of God, Quotes from the Philokalia, Salvation, Theosis, Virtue, Wise Thief on July 19, 2014 by .